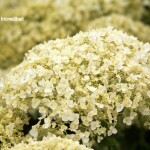 A rounded shrub with huge white flowers in the summer, held upright on sturdy stems. The flowers can be up to 12" across, and occur on new wood. It Is adaptable to many conditions, preferring some shade and an organically rich, well-drained soil. Prune to encourage new growth the following season, to develop heavier stems to support the large flowers. PP 20,571.